The 2018 bear market has been punishing, and despite falling prices, adoption is picking up. The number of Bitcoin-related transactions is on the rise and even rivaling those of MasterCard. Add that to the increasing number of Bitcoin ATMs, and it couldn’t be better. According to Data Light, Bitcoin teller machines are being installed all over the world at around six per day. It goes on to show that the number exploded from less than 50 in 2014 to 4,051 in Dec 2018. The future is bright. There are more Lightning Network full nodes, and the capacity is expanding with every addition. Just recently, an artist, Cryptograffiti, sold his piece for $0.000000037 further demonstrating that it is possible to send micro-transaction over the blockchain via off-chain solutions as LN. Once more, the efficiency, speed and cost benefits of such an arrangement are evident because the buyer of the piece had to pay the least–one Satoshi breaking the record as the cheapest artwork to ever sell via the LN. What’s even interesting about this is that the motivation was more technical than profit. It is such initiative and promotion that would lead to further adoption. Not only will this prop price, but widespread use would also make governments endorse the use of crypto and other blockchain solutions opening up doors for further investment channels and investor diversification. On a weekly time frame, BTC is up 20 percent against the USD reaffirming the presence of buyers. After 12 months of value wiping lower lows, the Bitcoin market is ready for a turnaround. Since we have a bullish engulfing pattern in the weekly chart, we expect BTC prices to expand throughout next week and close the year on a high ideally above $4,500 and even $5,000. In the 4HR chart, BTC did slow down, retracing from Dec 20 highs of $4,300 to spot levels. However, this is positive. Though we remain bearish from a top-down approach, there is an opportunity for aggressive traders to load up on every dip in lower time frames. At spot rates, BTC is bullish as long as the price is moving within Dec 19, 1100 HRs high-volume bar. It had a wide trade range. Most importantly, bears did reverse those losses despite the last two days lower lows meaning bulls have the upper hand from an effort versus result perspective. However, for assurance, the best approach is to wait for strong gains above Dec 20 highs at $4,300. Any upthrust at the back of above average volumes might propel BTC prices above $4,500. 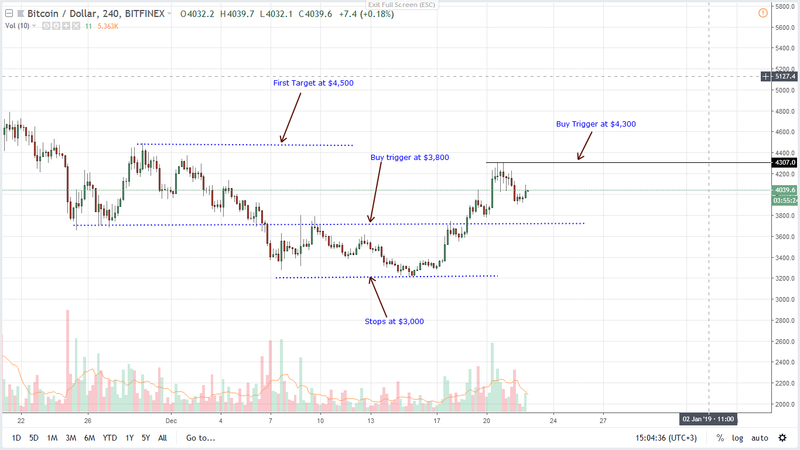 The post Bitcoin Price Analysis: BTC Resilient, Foundation Set for $6,000 appeared first on NewsBTC.